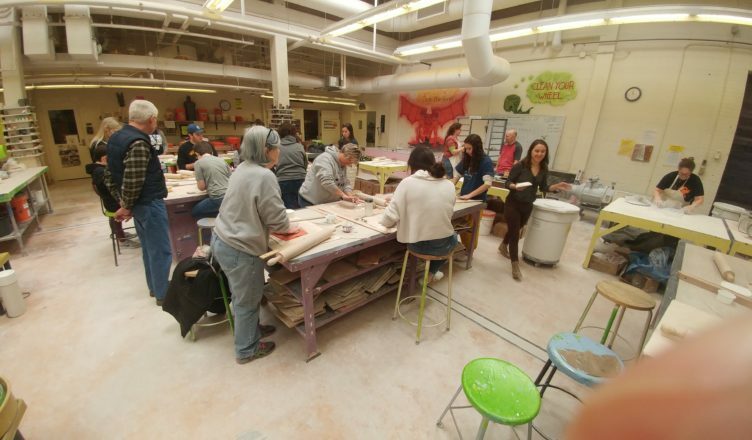 Towson University’s departments of Academic Affairs and Art held an empty bowls workshop in the Center for the Arts last Saturday to allow Towson community members an opportunity to participate in the Empty Bowls fundraiser. Held by St. Vincent De Paul, the Empty Bowls Baltimore fundraiser is an event geared towards helping members of the community who struggle with poverty and homelessness. The fundraiser is based off of the “Empty Bowls Project,” which is an international, grassroots, craft-based effort to bring an end to hunger. During Empty Bowls Baltimore, participants can enjoy an afternoon of entertainment, soup tastings, and take home a hand-crafted bowl for after paying an entry fee. The bowl is meant to symbolize hunger in the community. Proceeds go towards assisting those struggling with hunger. The next Empty Bowls Baltimore fundraiser will take place on March 23 at the Maryland State Fairgrounds in Timonium. Richard Holt, a TU professor of ceramics who hosted Saturday’s event, found out about the project through Baltimore Clayworks. In his workshop, Holt taught participants to make bowls from clay that would later be donated to the Empty Bowls fundraiser. Ginger Ross, one of the guests in attendance at the workshop, said that she was inspired to get involved by a friend of hers. “I came out specifically to Empty Bowls because of one my girlfriend’s does it, so me and my family go to the Empty Bowls and observe all the bowls on display,” Ross said. Darlene Eickhoff, a Towson community member, decided to attend the event because homelessness is an issue close to her heart. Renee Baylin, another community member, said she felt the workshop sounded like a lot of fun for a great cause. Ashley Lawton, a Towson Junior majoring in English, said that it was a great opportunity to help the campus out. Another Empty Bowls Workshop will be hosted Feb. 16 for those looking to get involved in the fundraiser. The cost of attending the workshop will be $15, and is open to the public.